Days removed from seeing Star Wars: The Last Jedi, I still can’t believe it’s a real movie. I can’t believe what writer-director Rian Johnson did: He took all of our preconceived notions of what a Star Wars movie is and evolved them. The movie is genuinely shocking at times—multiple times—but it also feels fully authentic to the Star Wars universe. And this is why The Last Jedi is so good, even if there are a few hiccups along the way. The Last Jedi picks up right where The Force Awakens left off. The Resistance has won an important victory against the First Order by blowing up Starkiller Base, but lost its allies in the New Republic. At the same time, Rey has finally tracked down Luke Skywalker, hoping to enlist his help. Those two storylines make up the bulk of the movie and Johnson hits the ground running with both. He instantly creates a tense, engaging tone for the film, because from moment to moment, you truly don’t know what’s going to happen next. Any time things seem to be going one direction, they don’t just zig or zag, they blast off into another dimension entirely. And it happens again and again. For example, parts of the film are very funny—like, almost too funny. The humor can, at times, feel overboard from what we’re used to in Star Wars. And yet it works. Then there are parts of the film that are incredibly weird and almost surreal—moments that seem more fit for an avant-garde movie. But they work too, because the very nature of Star Wars is that anything is possible. From scene to scene Johnson is basically saying, “Look, if we can have talking slugs, laser swords, and lightspeed, why can’t I do this?” And then he does it. Thankfully, all that quirk and surprise never comes at the expense of spectacle, and The Last Jedi has plenty of it. Epic lightsaber fights, huge space battles, one-on-one duels—there’s rarely a moment when something amazing isn’t happening onscreen. And yet, that Star Wars iconography is always punctuated with Johnson’s personality. John Williams’ excellent score can be soaring on the soundtrack, or some familiar setting or ship can show up, and Johnson still manages to put his own unique spin on it. The film’s epic 150-minute runtime allows plenty of room for Johnson’s inventiveness, but there’s also a tiny bit of fat in the middle of the movie, specifically in the Canto Bight scenes with Finn and Rose. The casino city itself is gorgeous and has some crazy-cool characters, plus Finn and Rose’s presence there shines a light on some new, worthwhile themes for the Star Wars franchise. However, in terms of the overall story, the whole escapade feels a little pointless and small. It doesn’t help that Benicio del Toro’s new character, DJ, who is part of the same storyline, is largely insignificant. Everyone else in the movie is given heightened significance, though. 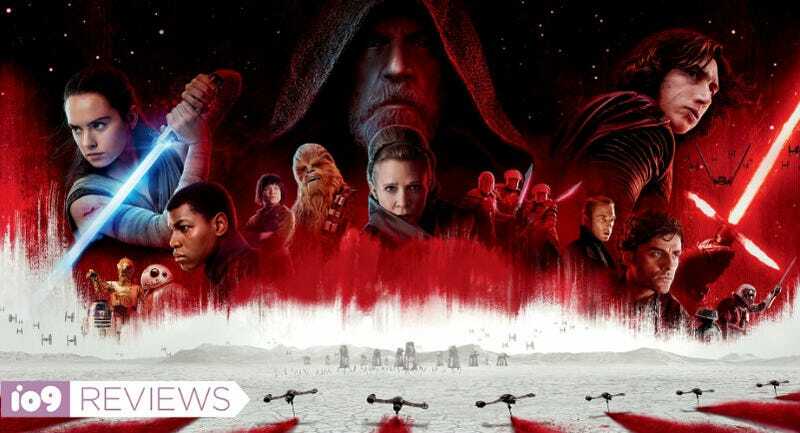 If you loved what Daisy Ridley and Adam Driver did with Rey and Kylo Ren in The Force Awakens, The Last Jedi is going to blow you away, as both characters evolve in mesmerizing ways. Poe Dameron (Oscar Isaac) has tons more to do and we’re all better for it. The same goes for General Hux (Domhnall Gleeson), who is arguably the funniest character in the film, as well as Supreme Leader Snoke (Andy Serkis), who is deliciously evil and confident. And while Finn and Rose might not have the best storyline overall, John Boyega and Kelly Marie Tran are each wonderful throughout it. Their chemistry feeds into the energy that permeates The Last Jedi. Finally, Laura Dern’s new character, Vice Admiral Holdo, gives the film a strong new leader and some of the movie’s best scenes. Then, of course, there’s Mark Hamill and Carrie Fisher. Hamill’s return to Luke Skywalker is as complex a performance as we’ve ever seen in a Star Wars movie. You can feel the conflict and pain on his face in every scene. Fisher too has an expanded role, and the more she does and says as General Leia, the more emotional the movie gets, resulting in a worthy farewell performance. Once The Last Jedi kicks into its final act, the film’s somewhat saggy middle is forgotten and forgiven. The final hour or so of the film is filled with truly intense and shocking moments—all while Johnson also finds time to examine more complex things that Star Wars has never dealt with before, like celebrity, war profiteering, and the importance of letting go of the past. By combining the spectacle and this thoughtfulness, Johnson has made the entire experience of The Last Jedi incredibly rewarding. “Experience” is a good word for it, too, because that’s what The Last Jedi feels like. It’s a movie, sure, but it’s somehow more than that. Maybe that’s just because it’s Star Wars. Maybe that’s because it’s so densely packed with mythology and entertainment. But either way, The Last Jedi is a top-of-the-line, A-plus Star Wars and scifi movie—one that we’ll be watching and discussing for as long as there’s a galaxy far, far away.